What do we do when we have a problem forgiving someone? How do you use God's energy scientifically? What protection is there from radiation from computers, cell phones and other unseen energy? How is mantra different from prayer? What does visualization have to do with the science of the spoken word? Elizabeth Clare Prophet talked about the uses of energy and instructed us on a number of techniques. It's such a fascinating subject. Let's go a little further into it. My first advice to someone who would begin to use God's energy in a scientific way is that you need to establish a forcefield of protection around your aura and around your chakras because you will now be qualifying the energy of life within you in a different manner than most of the people on earth today. In addition, our bodies and our minds are constantly subject to all types of energies—energies from earth, radio waves, television waves and rays from the sun. We are all influenced by the mass consciousness, by thoughts and feelings of people near and far. We have to realize that through the media, through everything that we have eye contact with, from the daily newspapers to the billboards, there is an impression made upon consciousness; and this, too, is the qualification of energy. If we are going to take dominion within the microcosm of the self, we need to establish a forcefield that is going to protect the new consciousness, the cosmic consciousness that we are in pursuit of and that we desire to experience every day. There is an energy of white light that we can draw forth from the I AM THAT I AM within us, from this great I AM Presence. This white light of energy is called the tube of light. To visualize this tube of light, you can see yourself standing in a giant glass milk bottle filled with milk. The top of the milk bottle, as it narrows, is going toward the source of energy, which is the I AM Presence. The energy comes into that giant milk bottle over the crystal cord, which looks like a straw going from the milk bottle straight up to an energy field that is a high concentration of light. So the invocation of the tube of light is a way of setting your forcefield for meditation, for the science of the spoken Word or just for your daily activities. 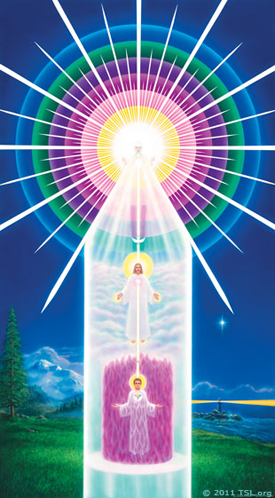 As I am giving this mantra to God the I AM Presence, I am visualizing myself standing inside this giant tube of light, this giant milk bottle. Around me, within it, I see the energy of the violet flame saturating my form, flowing through my body, blazing through the skin, through the arteries, the veins, the arms, the legs, the extremities. And I am feeling a saturation of my being with the energy of the Holy Spirit. As I give the mantra, I am concentrating on this vision of the Self, and that which I see, the energy I invoke, I will become. The energy of God will actually coalesce around your visualization. It will also manifest according to the direction of your Inner Self, your Real Self, who is always the director of the mantra and the meditation. You'll notice how I give this mantra. Mantras are to be given with a certain commanding presence, a certain authority that we use in dealing with God's energy. This is what makes the mantra different from a prayer of supplication. Prayer is a talk with God, a conversation or communion with God, a request. A mantra is a decree of the alchemist—the one we call “the artisan in the temple,” the one who is working out the alchemy of the equation of being. In other words, you're saying that people have the right to order God? People have the right to use God's energy in God's name. It is recorded in the Book of Genesis that when God created male and female he said, “Take dominion over the earth.” God gave to us the command, and our answer is to command the energies of earth to come into alignment. We command energy when we build an airplane or a ship. We command energy when we use advanced technology or split the atom or plant a garden. We are taking dominion over the earth each time we take on a project that is for the general welfare, for the commonweal, for the blessing of all. This is commanding God. Now, that sounds like blasphemy because we have not thought in terms of God being energy, but all of life is God. And this is not pantheism; this is the awareness of the omnipresence of love. Are you saying that we're taking a shortcut? Instead of spending a great deal of time building our project, we're going directly to the source? Yes, we go to the source. We predetermine what it is we desire to accomplish, we call forth the energy and we seal it in a pattern or a matrix that has already been designed by God and that we are confirming or ratifying by our free will. The material you have discussed sounds very much like all the ingredients for ritual. Would you talk about the element of ritual in using the science of the spoken Word? That little word ritual has an interesting meaning to me. I take it apart and I think of “right-you-all.” Ritual, then, whether it is in the laboratory of the scientist or at the keyboard of the concert pianist, is a way of ordering energy for its greatest use by mankind. Right-you-all means the “righting of the energies.” We have all misqualified God's energy. Yesterday we were angry. The day before we were jealous. The day before we had fear and perhaps torment or great grief. These are all misuses of God's energy. The goal of life is to qualify all energy with the law of perfection and the law of love. This is not impossible but very possible to us because we are the handiwork of God and because we are joint heirs of that consciousness that Jesus knew as the Christ and that Gautama knew as the Buddha. In the “Heart, Head and Hand Decrees,” beloved El Morya has given to us a mantra for forgiveness. This forgiveness puts us in tune with our inner Real Self, the Christ, who has the authority within our being to forgive sin. Jesus was the personification of that Christ; and therefore when he went to heal he said, “Thy sins be forgiven thee.” In making that statement he caused the alignment of atoms and molecules, and therefore wholeness took place. Thus as we forgive life, life forgives us. Jesus taught us to pray, “Forgive us our debts, as we forgive our debtors.” This mantra for forgiveness demands that we release forgiveness to everyone. Wherever we have the sense of injustice or we have been wronged, we visualize this violet flame of forgiveness going forth from our heart, going forth in this mantra of the spoken Word. We visualize it contacting every individual with whom we have ever had a misunderstanding, and we feel a tremendous peace and love and a resolution of discord in problems that have occurred. When we sow energy as good vibration, we reap energy as good vibration and we start an upward spiral. The culmination of that spiral is soul liberation, whereby the soul reunites day by day with the Spirit of the living God. As Paul said, “I die daily,” so we say, “I ascend daily.” The dying is the putting off of the old man; the ascending is the putting on of the new man. Through the science of the spoken Word we are actually ascending every day.